Hardly a week goes by without my office receiving a telephone call from a veteran or his widow describing the horrors of VA medical negligence. It’s prevalent, and we see it all the time. Veterans trust their medical care to the Veterans Health Administration only to find themselves suffering greater and more severe disabilities as a result of medical negligence and medical mistakes. Too often, these cases involve wrongful death as a result of VA negligence. One story comes to mind because it illustrates the tragedy that happens in VA medical facilities. My client was married to a U.S. veteran who she met shortly after the Second World War. She was from Poland. He was from California. They moved back to the United States and he, of course, dealt with the disabling effects of Post-Traumatic Stress Disorder. Of course, in those days, they didn’t call it PTSD. They called it Shell Shock or Combat Fatigue or nervousness, or something to that effect. But, nevertheless, we now know it was PTSD. Over the years, they remained married, and she remained a faithful and dutiful wife. His PTSD continued to deteriorate, and his condition got worse and worse. It got so bad that his wife could not leave him alone. She needed to find an adult daycare center for him or bring some type of person into the home to watch him. He would often leave the house and wander around outside and get lost and couldn’t find his way back to the house. It was becoming very problematic. Finally, the decision was made. The family agreed. The veteran would have to be placed in a nursing home. So, the veteran was placed in a nursing home where he continued to be treated with his medications by the VA, and they prescribed medications to treat his PTSD symptoms. Some of those medications had some side effects. Some of those medications are known to cause unsteadiness and increased the risk that somebody might fall. VA continued to prescribe these medications, and one day the veteran was walking down the hall in the nursing home, and he fell. And, of course, at that age, by this time he was an elderly man, the bones are not as strong as they used to be, and he suffered a hip fracture. A tragedy at any age, but in this case, given his medical problems, his advanced age, this was particularly devastating. So, he was then transferred to a VA hospital, and the decision was made to do surgery with a hip replacement to fix this broken hip. So, they did. They replaced the hip, and as is customary, they placed the veteran on Lovenox, which is a blood thinner that is usually prescribed following hip surgery to prevent blood clots. And, that was appropriate. Our client never disputed the appropriateness of prescribing a blood thinner. However, a few days later, the veteran started to vomit up coffee ground colored blood. He began choking. What was going on was, he was experiencing a gastric hemorrhage, and he was bleeding. And, he eventually died, suffocating in his own blood. It was a tragedy. Our client eventually filed what’s called an “1151 Claim” against the VA, alleging that there was negligence to prescribe medications that could increase his risk of falling. Our client initially reasoned that it was the fall that caused the hip replacement which, in turn, caused the gastric hemorrhage. She also argued that there was inadequate supervision in the nursing home that should have kept him from falling by watching him more closely. This is something that blocks the acid. It helps to prevent erosions in the gastrointestinal tract. And, this would have prevented the bleeding that eventually caused his death. So, our medical expert argued that there was VA negligence in failing to prescribe either an H2 Blocker or what’s called a “Proton Pump Inhibitor” medication in conjunction with the blood thinner medication. We argued that there was a high risk of gastric bleeding in response to the stress of the surgery and that he should have been prescribed that medication as a defense against potential gastric bleeding. So, essentially, our medical expert argued that there was VA medical negligence in failing to prescribe defensive medications that would have prevented the very cause of the veteran’s death. The VA fought us. The VA claimed there was no duty to prescribe the other medication. We fought back. The case went up to the U.S. Court of Appeals more than once. We hired more experts. And, in the end, we finally prevailed, and the widow received her benefits. 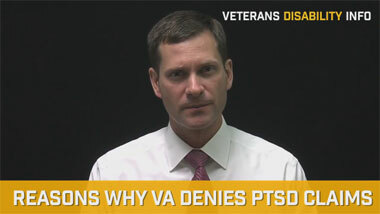 However, the widow never filed a claim in federal court for VA medical negligence. She never filed a tort claim. 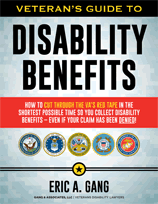 Yes, there is the availability of what’s called an “1151 Claim,” which is where the VA will pay you a monthly compensation check for the additional disability that’s caused by VA medical negligence. But, those claims are not jury awards that pay hundreds of thousands of dollars in tort compensation. A tort is essentially a civil cause of action, and that’s legal terminology, or lawyer parlance, or legalese, that refers to somebody’s ability to sue for money damages based upon an injury that is caused by somebody else’s negligent behavior. So, this illustrates the point that whenever there’s been an injury as a result of VA medical negligence, a veteran must be diligent in pursuing his or her legal rights, right away, before the time period elapses. There are a couple important considerations when addressing VA medical negligence. And this, of course, applies to any form of any medical negligence. Number one, in most medical negligence cases, there are always damages. What that means is, there are always injuries or additional problems that resulted from the medical procedure. That goes without saying. However, it is important for you to distinguish between a bad result that could occur because it’s a risk, a known risk, of the procedure, versus something that occurred as a specific result of the VA doctors failing to perform their duties properly. And, unfortunately, I’ve seen many veterans and their widows assume VA negligence simply because a bad result happened. You must guard against this tendency. Medicine is not an exact science. There are risks inherent in any procedure, and a doctor could do everything right, and one of the risks could actually manifest itself, and a bad result could occur. So, we’re talking about situations that go above and beyond merely a bad result. There must be a bad result coupled with evidence that the VA failed to perform medical procedures or provide medical care in a way that was considered proper. The range of problems that can occur from medical treatment are vast. If you or a loved one has suffered additional medical problems, or even death, as a result of VA medical negligence, then it is very important to contact a lawyer who is familiar with VA medical negligence. I’ve seen cases where wounds were not cared for properly, resulting in unnecessary amputations. I’ve seen cases involving the wrongful death of veterans due to negligent medical care. 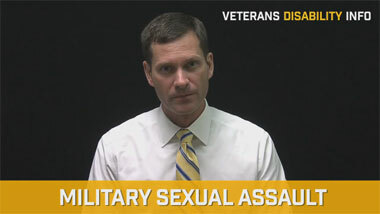 If you’re a widow, and your spouse died as a result of VA medical negligence, if you’re in that position, I encourage you to contact a veteran’s attorney who may be able to help. 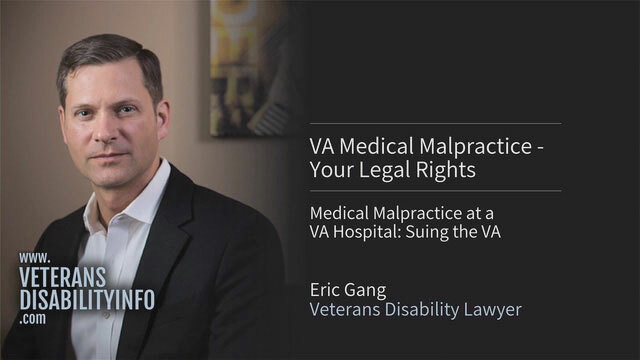 My name is Eric Gang, and I’m a veterans disability benefits attorney, and I’ve represented veterans all over the world. And, over the last decade alone, I have recovered literally millions of dollars on behalf of disabled veterans and their spouses, just like you. So, if you suspect medical negligence on the part of the VA, I invite you to contact me. We have attorneys standing by who may be able to help you recover a large cash award as a consequence of VA’s medical negligence.